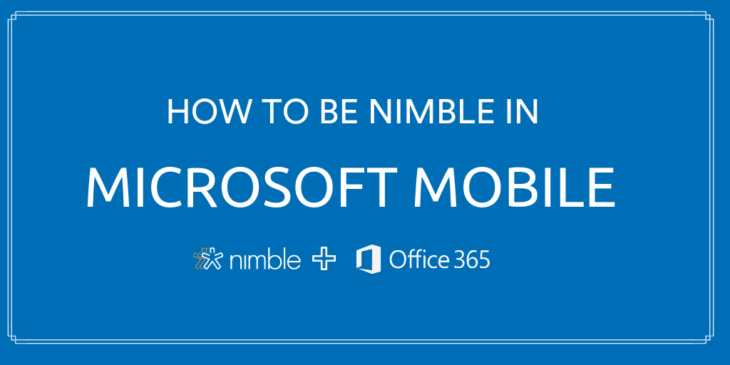 How to Be Nimble CRM in Outlook Mobile. In the Modern Workplace, small business teams aren’t just using technology — they are being transformed by it. Previously in our Nimble Workplace series, we introduced the power of integrating Nimble with Office 365 to qualify the people who matter most to your business in order to reach out in an authentic way to build trust, engagement, and conversions. In this post, we’ll show you the benefits of using Nimble within Outlook mobile to access your team’s unified relationship manager, add new contacts or to-do’s, and tap into business and social insights on your key prospects — all while on the go with the Smart Contacts add-in. 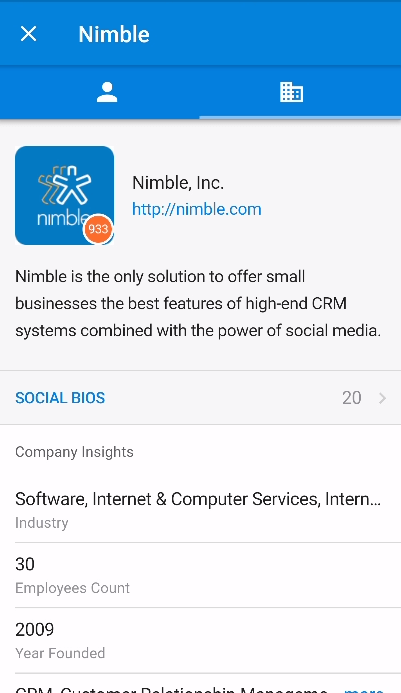 Nimble is the first social sales and marketing CRM that works for you everywhere you engage: inside Office 365, on social media channels, in your web browser, in 140+ SaaS business applications (including Microsoft Dynamics), and on your mobile device. Nimble automatically builds and updates itself for you by combining your team’s contacts, communication history, email and calendars into one unified relationship manager enriched with the business insights you need to take action. With the Nimble Smart Contacts Add-In for Outlook mobile, you can nurture relationships as easily and effectively on Microsoft’s Outlook app for mobile devices as you can on your desktop. Open the Nimble Smart Contacts add-in for Outlook mobile by clicking on the three dots at the top right-hand corner of your screen. 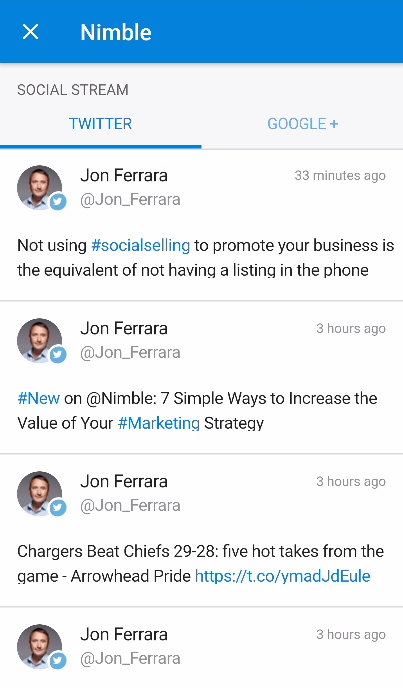 Scan social insights (including tweets) to understand what moves your prospect; what do they care about? What motivates them? Gain business insights on companies to fully understand the scope of a potential deal. Nimble will deliver enriched contact profiles with details about who they are, where they work, where they’re from, their interests, and their complete social profiles — delivering a full 360 view of the contact you are communicating with on both a business and personal level. You can then add this person to your Nimble database, along with the information that has been automatically gathered. The Nimble add-in for Outlook mobile will also deliver insights on the related company – providing you full company details such as the industry, employee count, the year they were founded, matching keywords, CEO, company type, revenue, location, phone numbers and much more. Social profiles for the companies are also provided to give you a better idea of the companies social presence, who they follow, and who’s following them. People insights include name, company name, title, biography, location, work experience, areas of influence, education, and social identities. Up-to-date company and contact details and engagement history with your team members. Social insights are freely available for all Microsoft Office 365 Outlook email accounts. Upgrade to a paid account to access team contacts, schedule follow-up tasks, and full contact engagement histories. Nimble is constantly improving your mobile workflows so you can focus on relationship building with prospects and customers rather than on Google research or cumbersome data entry. When interacting with your newly Nimble-fied contact via email, you will have access to the business and social insights you need to take insightful action for every conversation — directly within your Outlook inbox. Once your contact has been added to Nimble, you can continue working with them from within the Smart Contacts app. You can then tag important contacts to segment them into lists for future follow up. To ensure you stay top of mind with all of your important contacts, set follow up reminders using the “Stay In Touch” feature. Nimble also unifies you and your team’s email history, providing you with a shareable inbox filled with all of the interactions related to a given contact. This allows your team to effectively engage with your contact with contextual, seamless conversation. 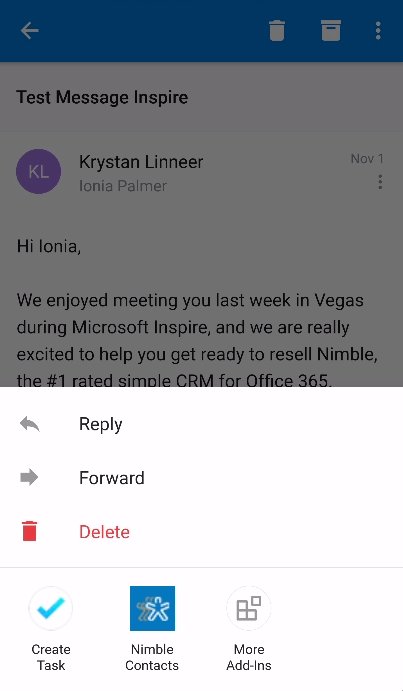 The Nimble add-in for Outlook mobile also enables you to log notes, create tasks for additional follow-up reminders, manage deal pipelines, set up calendar events, delegate projects to a team member, and more. With your Nimble freemium subscription, you can view up to ten enriched contact profiles per day. Upgrade your account to receive even more insights on your key prospects and start closing more deals, faster. Learn how to get started on our FAQ page. Our Smart Contacts add-in for Outlook Mobile is one of many features available for all Nimble plans! If you do not have a Nimble account yet, we invite you to try it for free for 14 days.